Yesterday I parked as usual at the Olentangy River Road lot where there are often many spaces and it’s a pleasant walk over the footbridge to the main part of the campus. Parking along the river is botanically rather interesting. Question: Why do places like Indonesia, India and China have so many aspen and cottonwood trees? Answer: Because those are very Populus places! 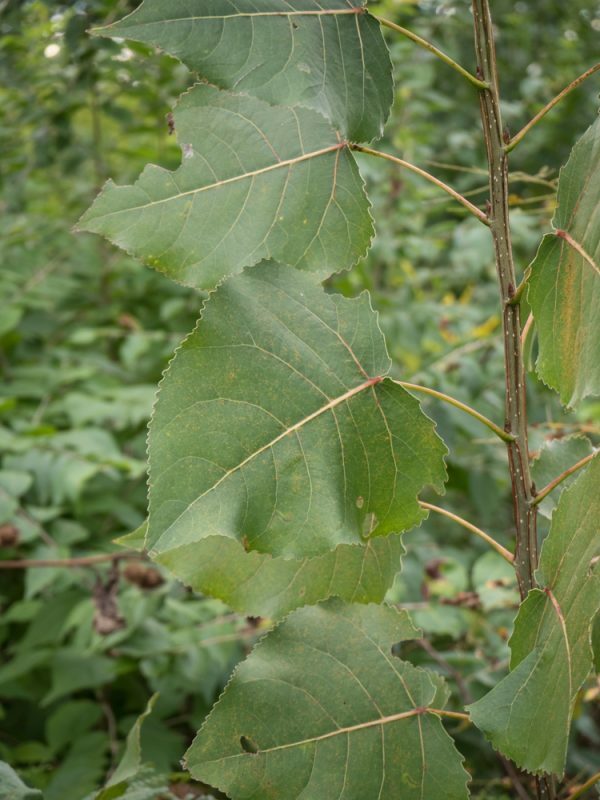 Eastern cottonwood leaves are distinctively triangular. The specific epithet “deltoides” is in reference to the leaf shape. American sycamore is also a lowland tree, occurring mainly along rivers. There are some huge individuals on the OSU campus, including along the river bank. It’s a most distinctive tree, with bark that is constantly peeling off in irregularly shaped pieces resembling jigsaw puzzle pieces. 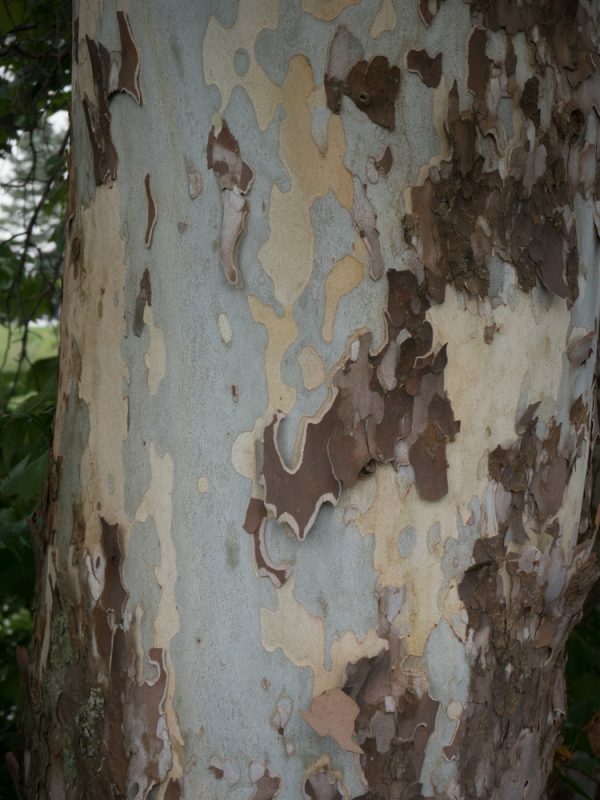 American sycamore has jigsaw-puzzle bark. Sycamore trees produce their tiny wind-pollinated flowers in globose heads. Here’s a fruit cluster. 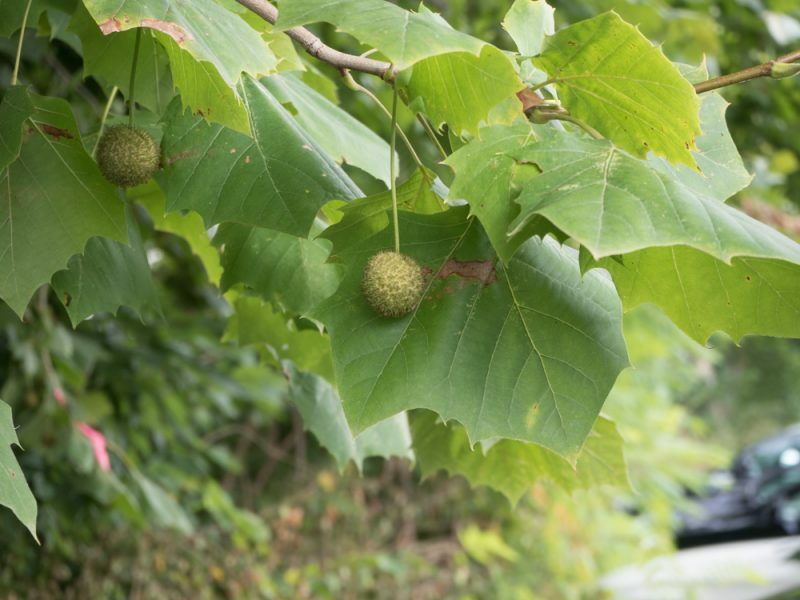 American sycamore fruits are multiples of achenes. Ohio buckeye is a distinctive small tree, owing to its large, oppositely arranged palmately compound leaves. 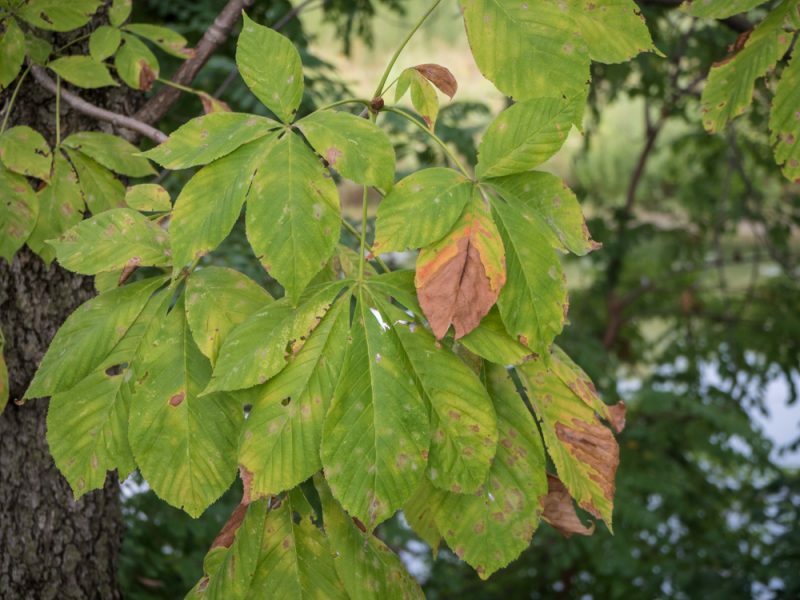 It is one of the earliest trees to leaf out in the Spring, and also the earliest to lose leaves in Fall. 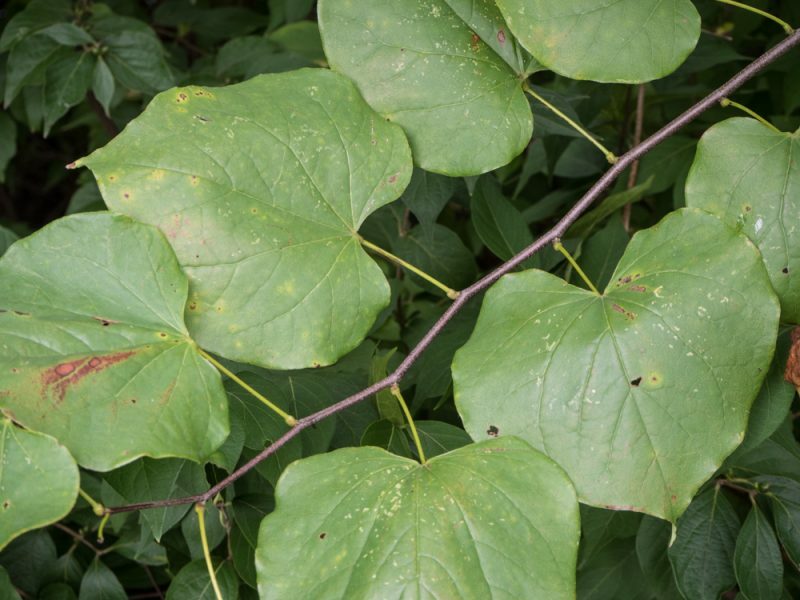 The foliage and nuts are poisonous,and according to this interesting Illinois Wildflowers website entry, the species is avoided by deer. Buckeye leaves fall rather early. Hackberry is a member of the elm family (Ulmaceae) and shares with elms the overall leaf appearance –simple, alternate, doubly-serrate, and with an unequal-sided leaf base. 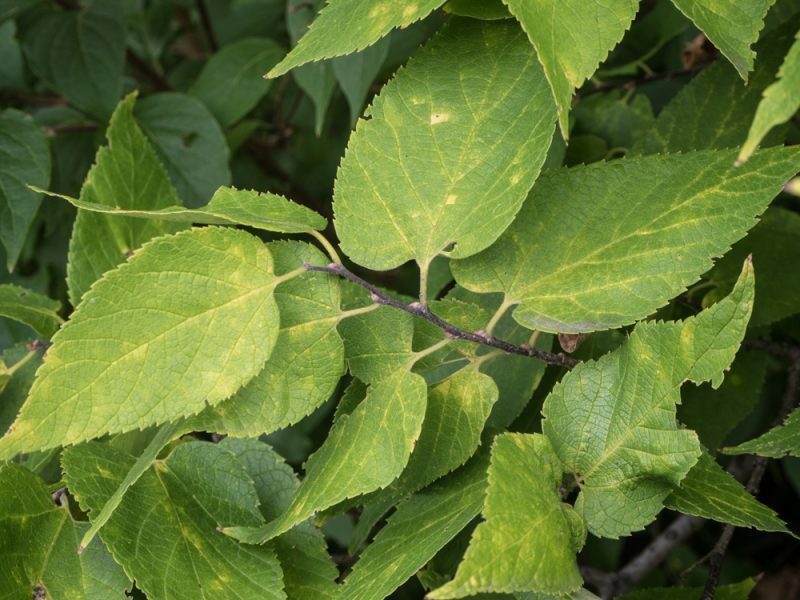 Hackberry leaves are unequal-sided and double-toothed. Just based on the leaves, hackberry is a pretty indistinctive tree. It looks vaguely elm-like. In fruit, it stands apart from elms by bearing little pea-sized drupes, very unlike the dry flat winged samaras of elms. Hackberry bark is more deeply furrowed than any other Ohio tree. 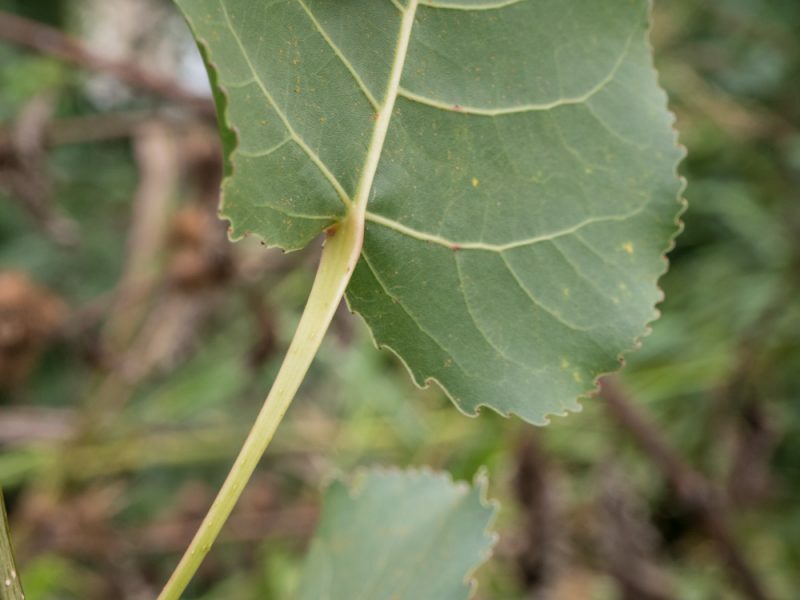 Later in the season look for little pencil-eraser shaped projections on the bottoms of hackberry leaves that are galls caused by a psyllid (a type of true bug in the order hemiptera). According to the Texas A&M extension service, these litle bugs sometimes enter homes! The pea family (Fabaceae) is an incredibly diverse one, containing herbs, shrubs and trees. 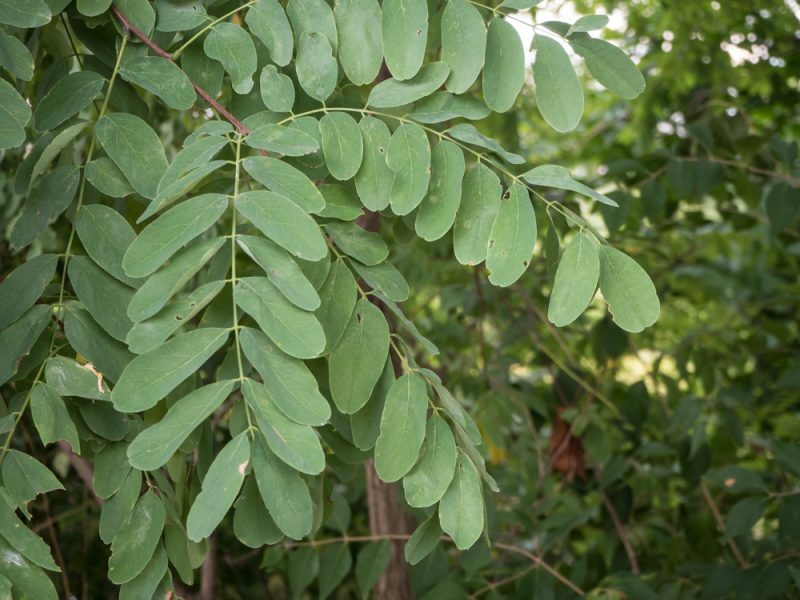 Honey-locust is one of the trees, although, unlike most members of the family it does not harbor nitrogen-fixing bacteria in its roots (Petrides, Trees and Shrubs Peterson Field Gide, pp. 126-127). The tree has an unusual leaf complexity, as the leaves are twice-compound! Honey-locust occurs naturally n Ohio, and when it does, is often beset with stout thorns all over the trunk and branches. 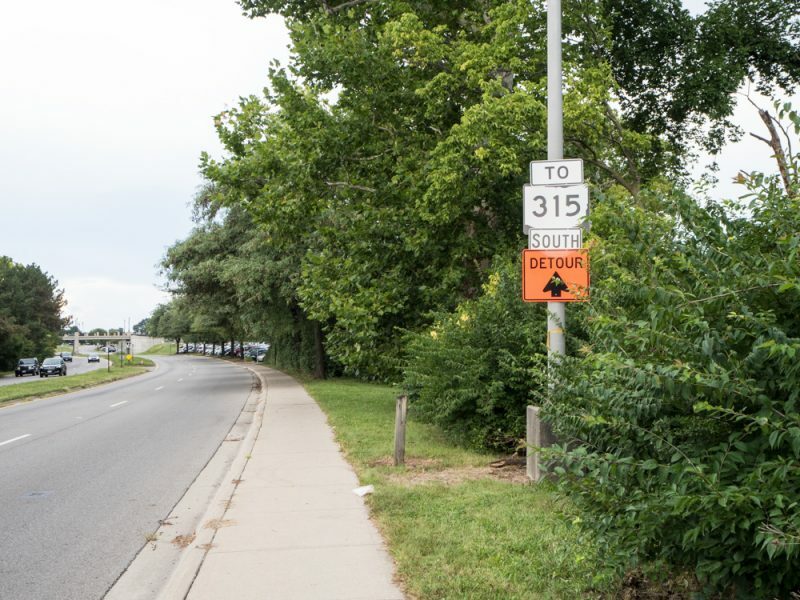 Along Olentangy River Road, there are some ornamental thornless specimens. They freely produce fruit, and seem to be spreading into the wooded riparian corridor. 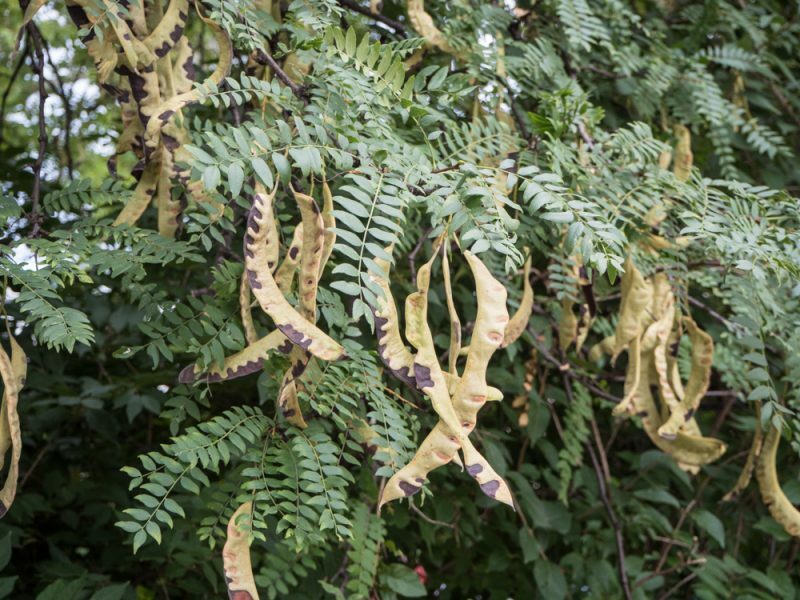 Honey-locust fruits are large strap-shaped legumes. Our Petrides tree book tells us that the fruits are eaten by wildlife and also that the sweet pulp between the seeds (but not the seeds themselves, which are poisonous) is edible. I tried a little nibble, and found it to be sweet but insipidly so, and not especially appealing. The pulp between the seeds is sweet and more or less edible. Also a member of the fabulous Fabaceae (pea family), black-locust leaves are only once-compound, with finger-sized leaflets. In her classic book The Woody Plants of Ohio (1950), E. Lucy Braun explains that the original range of this now-widespread tree is doubtful. Primarily a southern Appalachian tree during pre-settlement times and limited in Ohio to near the Ohio River, because it was widely planted for reforestation, erosion control and as timber (especially for fence-posts), blacklocust now ranges throughout the State. 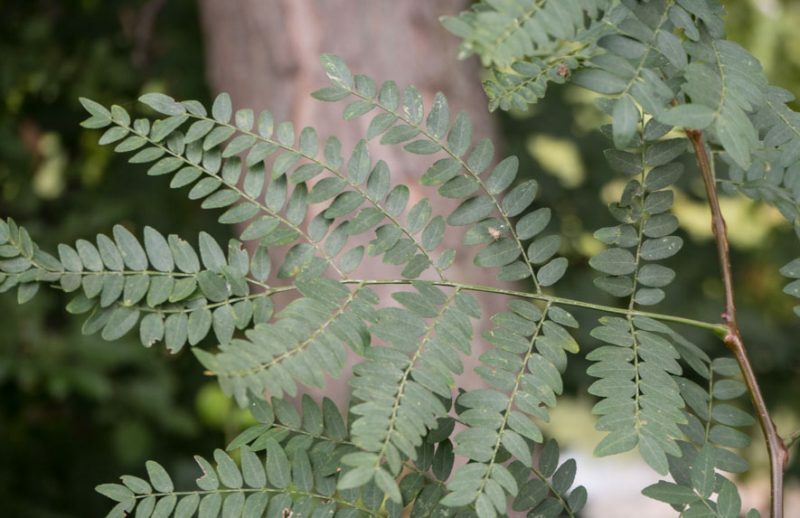 Black-locust has once pinnately-compound leaves with finger-sized leaflets. This is the tree the artists and editors of the New York Times used to illustrate their “Tree Blindness” article. A good choice, as it is striking in many respect and I imagine it is indeed a great thrill to watch as “pollen-drunk” bumblebees forage on the flowers. They should move Valentine’s Day to summer so that we put these little hearts to good use! 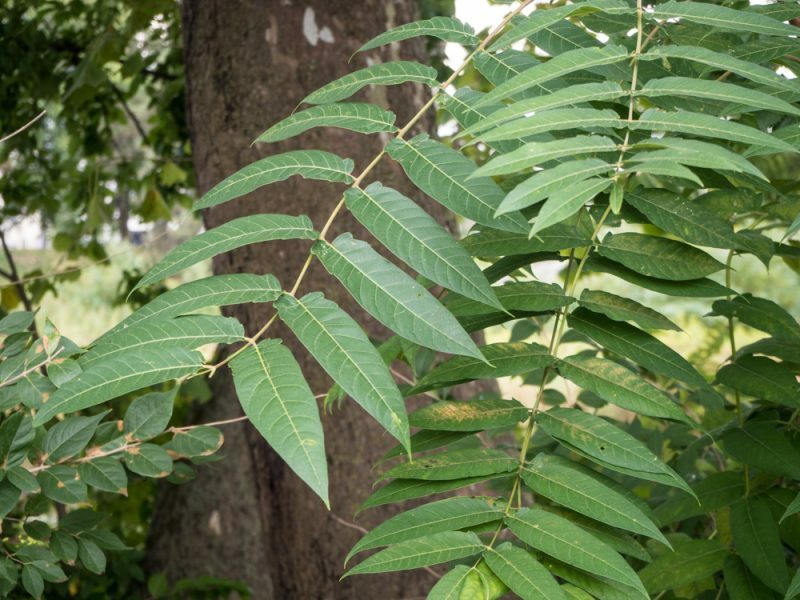 Tree-of heaven is an insanely fast-growing tree –Petrides (1958) calls it the “Most rapidly growing woody plant in our area,” citing values of 8 feet per year for established trees and 12 feet for new sprouts! The common name apparently is in reference to this heaven-ward growth. It’s such an invasive and weedy plant that it might better be called “tree of H-E-double hockey-sticks”! Tree-of-heaven has large pinnately compound leaves. 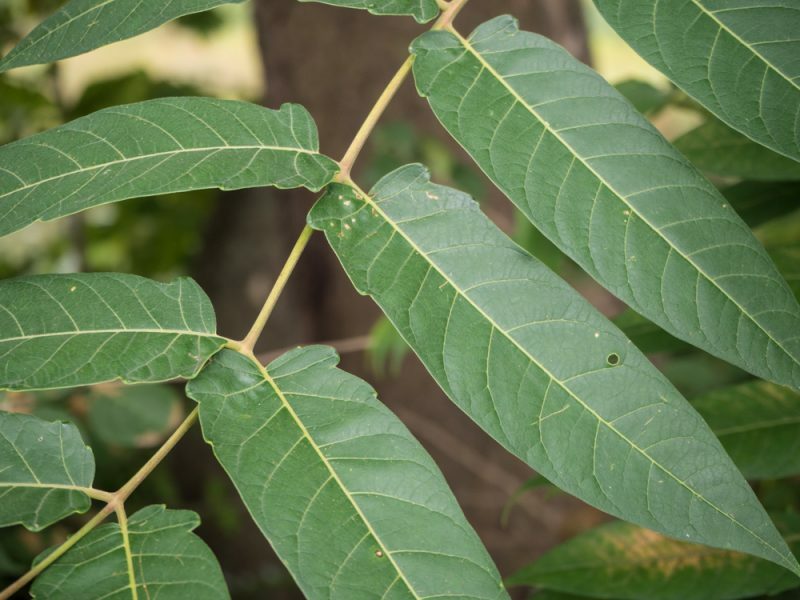 Tree of H-E-double hockey-sticks has alternately arranged large pinnate leaves and so might be mistaken for black walnut. 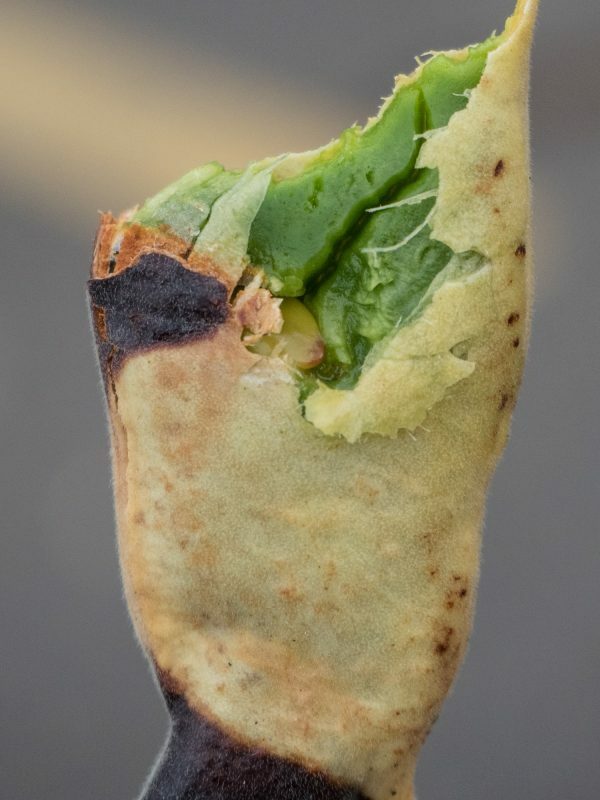 In addition to the distinctive aroma of the crushed foliage and scratched twigs –smelling like fire and brimstone rancid peanut butter –the leaflets sport an intriguing pair of pimple-like glands at their bases. The photo below shows the glands. Tree of H-E-double hockey-sticks leaflets are lobed at the base, with a gland on each lobe. Popkin mentions a lot of great reasons to cure yourself of tree blindness. She even states that is “madness” that we don’t avail ourselves of the wild food that trees produce, although she admits to impatience about leaching tannins from acorns. Similarly, my “just so-so” experience with the honey-locust didn’t keep me from stopping at Kroger on the way home. Nonetheless, there are other ways to engage with a tree, and, as she says, momentarily leave the human-created world.